Tag Archive | "Great Swamp"
It’s good for the soul to remember that there are beings greater than us. But with the emotional junk that humans cart around, it can be difficult to latch onto that perspective. A trip to the wondrous Raptor Trust in Millington, New Jersey (http://theraptortrust.org/) is the antidote to this dilemma. I discovered this firsthand when I journeyed there this past weekend, to one of the nation’s ground breaking avian rehabilitation and conservation centers. Navigating previously unexplored back roads, it soon became clear that the sanctuary/avian hospital/ educational center was situated in a desolate area. I define “desolate” as “untouched by the hands of men.” Great stands of woods, brush, running brooks, and the creatures that inhabit these places have always calmed my soul. In my own neck of the woods, closer to so-called civilization, the air was nippy with a few clouds in a deep blue sky; many maples still clung ferociously to their confetti-colored leaves. But as I traveled north, the sky turned overcast, the temperature dropped quickly, and the trees rose dark and naked into the sky. Through the meandering back roads I climbed, fog-shrouded blue-gray mountains rising in the distance. On the last neck of the journey, I veered right at a small, whitewashed bridge. Abutting the Great Swamp, the center’s parking lot and small educational facility gave way to a large field, fringed with bare trees and cattails: a late autumn landscape clothed in brown, taupe, and gray. And then came a surprise. I’d first learned of The Raptor Trust several years ago, via an educational/fundraising exhibition in Cape May, New Jersey. Then, the many beautiful birds were all housed indoors, tethered to their perches for their safety and that of too-curious humans. The sole raptor I’d seen outdoors that day was a gorgeous peregrine falcon, capable of flying only for short distances. Behind the boardwalk replete with souvenir shops wheeled this magnificent raptor, lighting down after every circumnavigation upon the thick, leathered glove of a man who obviously loved him. Again, every other bird was inside the exhibition hall that day. Knowing that all of the birds at The Raptor Trust are rehabilitated after injuries sustained largely at the hands of man (or by osmosis, the spread of civilization that is rarely civil), I’d assumed that the birds would have been safe behind closed doors. However, with the exception of those recently admitted to the on-site, state-of-the-art hospital, every bird was outdoors. With no one taking an entrance fee (for there was no fee) and no caretaker visible, the place, at first, seemed deserted. With my husband, I tramped over leaf-strewn trails, desiccated leaves crunching beneath my feet and the wind whistling mournfully through the trees. The few others visitors we later encountered, children included, were quiet as they never would have been in a zoo. It was as if we had agreed in silent community that respect was called for in this wild place. In that peaceful landscape, outdoor enclosures stood large and double-netted … against uneducated humans, I suppose, who might not fully understand the power of a raptor’s talons. Two adult bald eagles were the first birds we saw: huge and magnificent. They stood as reminders that humanity is but one species on this planet and that we must honor every species with which we share the Earth. Walking on, we spied ospreys (fish eaters with wingspans of up to 6 feet), small, pretty kestrels, whose wings stretch for two feet, and a lovely peregrine falcon (by the early 1970s, America had all but annihilated the peregrines due to DDT poisoning). Feathers ruffling in the chill wind, there were various other hawks and a few owls, including the tiny saw-whet. Weighing a mere 4 ounces and standing 8 inches tall, this elfin owl’s wings span a foot and half across or greater. The Great Horned Owl, with whose awesome relative I’d once communed at a PowWow, was not — to my disappointment — receiving company that day. Hoping to see more owls, I’m half-glad that I didn’t; once a bird is rehabilitated, it is released into the wild, if feasible. Those that cannot be returned are given a good, caring home at The Raptor Trust. So, I hope that most of the owls are now living free and healthy. The most surreal moment, however, came courtesy of the vultures … and not the ones in the enclosures. In a large pen lounged three vultures: a pair of turkey vultures and one black vulture. With a gulp, my husband whispered, “Look up.” In the bare naked trees above us, against a gray sky, were perched a good two dozen, large, wild, silent vultures. Directly over the enclosures, I sensed that they were keeping a vigil on their recuperating kin! Most people have been conditioned, falsely, to fear vultures. The fact is, these birds neither attack nor kill; I’m not sure why they are classified as raptors. They are, like many people in government and Corporate America, opportunists. But unlike our legislators and heads of business, vultures simply await other animals to leave sated from a kill so that they can enjoy the remains … including the marrow-rich bones. Vultures help to keep our environment clean; they rid the landscape of things that breed disease. They are good birds. So is every other avian at The Raptor Trust. Large and commanding or small and shy, there is beauty in their form, intelligence in their eyes, and dignity in their bearing. Although raptors are carnivorous, they merely live the way that God has designed them, at the top of the winged food chain. They are to be admired and respected. And given the behavior of humans, they are to be protected. 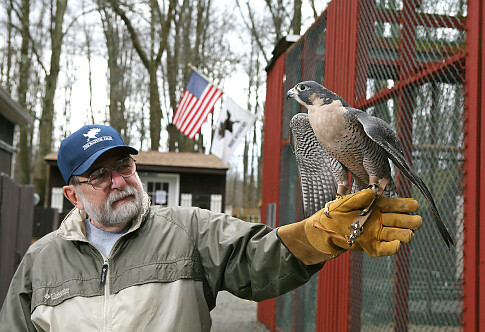 If you journey to The Raptor Trust, you will understand this firsthand. Gaze quietly at the magnificent birds and know that something greater than you created them, and that that Being has entrusted you with their care. 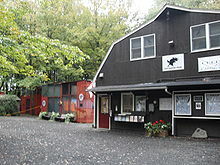 If you can, please leave a donation, for this rehabilitation and conservation center is a non-profit organization. Outside the drop-off for injured birds is a rich, portable library. From this, you are invited to take literature concerning the mission and history of the Trust and the birds themselves, including instructions for preventing injuries to, and methods of caring for, injured birds. Go softly into The Raptor Trust. Leave a small footprint, please. Go forth with an enlightened mind and a lighter heart.